We are a 100% Irish owned life assurance company offering protection, savings and investment products designed for the Irish public. Our success is based on the superior performance of our managed funds and on delivering excellent customer service at all times. Our mission is to "empower ordinary people to achieve extraordinary results". Our commitment to our staff and associates and the opportunities we give them ensure that they are deeply committed to delivering high quality products and service to our clients. Communicate regularly with you and provide you with easy to understand information on all aspects of your business with us. We believe that the race for Quality Service, Quality Products and Quality Performance has no finish line and our commitment to continuous improvement in our service, products and performance is never ending. Established in 1989, Acorn Life Limited is licensed under the Insurance Act 1936 and authorised under the European Communities (Life Assurance) Regulations 1984 to transact life assurance business in the Republic of Ireland. Acorn Life Limited is regulated by the Financial Regulator and is a member of the Irish Insurance Federation (www.iif.ie). It is an independent Irish owned company with its Head Office based in Galway. Acorn Life provides a wide range of financial services and is dedicated to excellence through advanced administration systems and quality customer service. It distributes its products through a nationwide team of over 200 sales associates. Acorn Life's investment service is also offered through a network of 140 brokers nationwide. At the end of 2006, Acorn Life had assets of €480 million and premium income was €112 million. Since inception investment performance has consistently been among the market leaders. 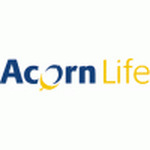 Acorn Life Limited is registered in Ireland, No 128945. Registered Office: St Augustine Street, Galway. Followers receive updates on new jobs or opportunities posted by ACORN LIFE.